Bayern conceded four goals – as many as they’d let in during the entire first half of the Bundesliga season – and were completely outplayed throughout. Wolfsburg coach Dieter Hecking brought Daniel Caliguiri into the side on the right, which meant Vieirinha was pushed back to a relatively unfamiliar full-back role. In the centre, Max Arnold got the nod over Joshua Guilavogui. Pep Guardiola started with a 4-1-4-1 system. Mario Gotze was only on the bench, while Bayern continue to suffer from injury problems, particularly in midfield positions. Wolfsburg’s performance here was outstanding, and this was one of the best counter-attacking performances of the season. Considering it was so unusual to see Bayern concede multiple times, it might seem odd to focus on what Wolfsburg did defensively – but their excellent defensive shape made life difficult for Bayern, forced Guardiola’s side to play poor passes and commit too many men forward, and this opened up space for rapid counter-attacks. It was the major part of Wolfsburg’s gameplan. The most obvious part of their approach was stopping Xabi Alonso, who has provided the metronomic passing from the base of Bayern’s midfield throughout this campaign. He’s often been given freedom as opponents concentrate on keeping it tight in deeper positions, but Hecking instructed his two central attackers – usually Bas Dost and Kevin De Bruyne – to remain tight to Alonso, always making sure he was occupied, and usually preventing Bayern from playing passes into him. It was reminiscent of the way Atletico often use their strikers to nullify Sergio Busquets when playing Barcelona. Alonso is a magnificent passer, but against heavy pressure he often becomes flustered because he doesn’t have the mobility or the trickery to get around the press. His international career was effectively ended by Chile’s incredible show of pressing in last summer’s World Cup, for example, and he often struggled against Barcelona in Clasicos. Here, Alonso probably didn’t do enough in a positional sense to escape opposition pressure, often received the ball in tight positions and was unable to raise his head and play a good forward pass. A couple of times he lost the ball when under pressure from two opponents, and Wolfsburg were able to launch mini-counter-attacks quickly. One moment in the opening five minutes summed it up. Dante brought the ball forward from a deep position, advanced towards Dost, and Dost effectively let Dante past him because he was so determined to shut off the passing angle to Alonso instead. Such attention on Alonso meant the centre-backs were free, and at one point Alonso shouted at the Boateng to bring the ball forward and play a forward pass, jealous of his complete freedom on the ball. 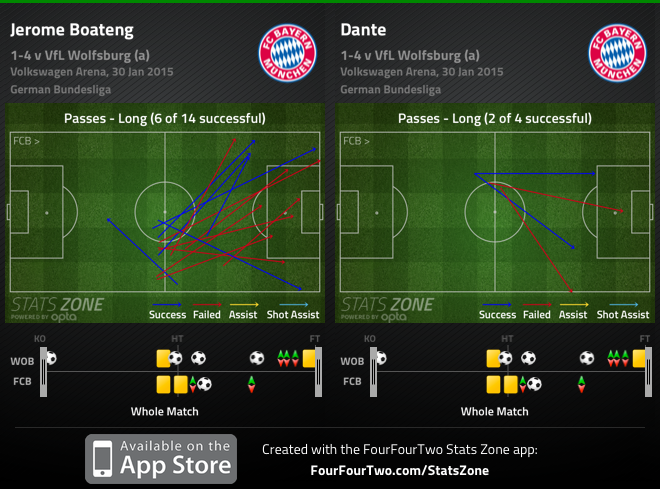 Deeper in midfield, Wolfsburg effectively man-marked Bayern’s central players. Luiz Gustavo was up against his old teammate Bastian Schweinsteiger and followed him around determinedly, while Arnold pressed Alaba well too. This meant Bayern’s centre-backs were unable to knock a simple pass into midfield – those players were all occupied – and instead launched a succession of diagonal balls. In particular, Jerome Boateng kept hitting long balls towards Thomas Muller, probably because Bayern wanted to test Vieirinha’s defensive capabilities – but they had little joy here. As long balls to Lewandowski were also a common feature, gradually the Croatian started to move deep towards the ball, almost becoming a false nine to offer an easy forward passing option. However, either of the Wolfsburg centre-backs tracked Lewandowski closely and attempted to win the ball quickly, with the other covering the space. 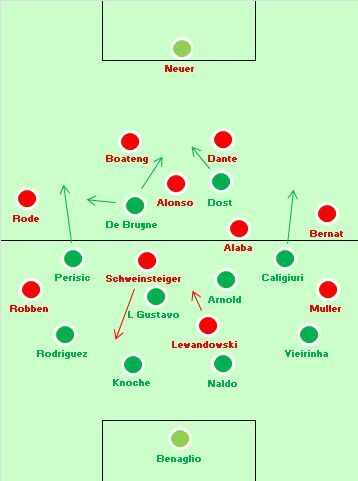 It was surprising that neither Muller nor Arjen Robben looked to move inside into a pocket of space between the lines, especially when Arnold and Gustavo moved up the pitch to press – that lateral movement might have caused Wolfsburg problems. Instead, Bayern’s only obvious tactic was to push Schweinsteiger forward – he made some determined sprints behind Lewandowski, but the service never arrived. Then, of course, there was what Wolfsburg did with possession – and this was simple but extremely effective. When they won the bal they played quick passing triangles to get around Bayern’s counter-pressing, and when they had a bit of space, then hit long balls towards the flanks, where the wide players were usually breaking past Bayern’s full-backs into space. Here, it’s worth pointing out that Juan Bernat and Sebastian Rode are the weak links in this Bayern side – technically good, but at this stage both promising, developing footballers rather than renowned international stars. Both endured a difficult evening. Rode, the right-back, particularly struggled against both De Bruyne and Perisic, who switched positions regularly. He was outpaced to long balls, beaten when attempting to tackle, and often simply caught too high up the pitch when Bayern lost possession in midfield. Wolfsburg attacked in great numbers – when possession was won, the front four would immediately sprint forward and were sometimes joined by Arnold too. With the Bayern full-backs pushing on, and Alonso only half-heartedly compensating by becoming an extra defender, it meant Dante and Boateng were covering the width of the pitch by themselves – often one would move out towards the touchline, the other would cover the space in the centre, and Wolfsburg could switch the play quickly. Time and time again, the home side launched a counter-attack and would have a man over at the far post, almost like a rugby team drawing the opposition narrow before knocking quick passers out to the wingers. Dost’s opening goal was the best example, but it kept happening. Guardiola changed his system at half-time and moved to a 3-4-2-1 shape, which meant Alaba retreating into the back three, and the wing-backs pushing forward. Schweinsteiger moved deeper alongside Alonso and no longer made forward runs, while Robben and Muller narrowed. Bayern now had a solid square in the centre of the pitch, and were able to play good passing combinations around Wolfsburg. They never entirely had control, but they were getting more time on the ball and causing Gustavo and Arnold positional problems. Robben had a decent effort following a lay-off from Muller, which wouldn’t have happened in the first half, as those players were 50 yards apart and never moving inside. Bernat started to get freedom – he was given license to go forward, and with Muller dragging Vieirinha into the centre, Bernat was free for a switch of play. He equalised – via a crazy Naldo error – in this fashion. But Bayern were still completely vulnerable to counter-attacks, and while the switch to a permanent three-man defence meant they covered the flanks more effectively without being exposed on the far side, they now suddenly had problems with simple, forward passes to a player finding space centrally. De Bruyne, the game’s outstanding player, scored the final two goals in gloriously easy circumstances. His first goal came, ludicrously, when he loitered behind Bayern’s three-man defence, received a ball over the top and was onside by virtue of being in his own half. His second wasn’t dissimilar, but saw him outwit Dante with his tricky dribbling before firing past Manuel Neuer from a tight angle. 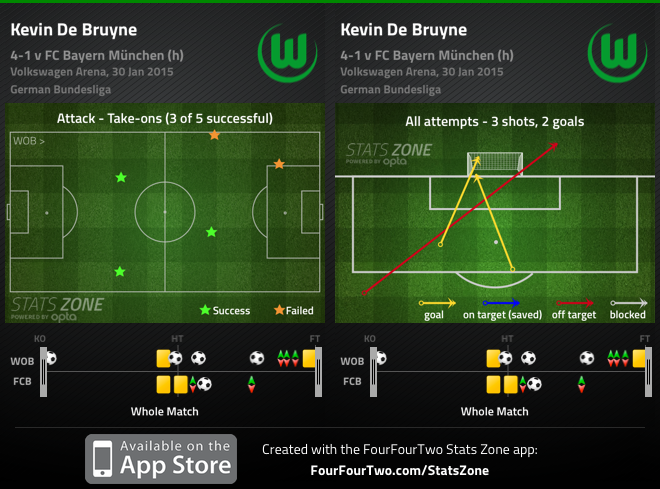 Those goals summed up the contest well – De Bruyne was outstanding, and Bayern couldn’t cope with counter-attacks. The most striking thing about this Wolfsburg display was its simplicity. They inflicted Bayern’s first league defeat of the season not through a surprise approach or an unusual formation, but simply by doing the basics well: shutting down Bayern’s passing, forcing them to play hopeful long balls, then counter-attacking into space. It was exactly the sort of thing Borussia Dortmund did so effectively during their period of Bundesliga dominance, and despite Guardiola changing many things since taking over from Jupp Heynckes, Bayern are still weak in this respect. Wolfsburg haven’t stumbled upon some kind of magic formula: most teams have played this way against Bayern – it just took the second-best team in the league, playing at home after a long break when they could press cohesively (and prepare their tactical approach for weeks) to play with this intensity. Bayern seemed shellshocked by their struggles, and they’re so unaccustomed to conceding the opening goal and having to chase the game. It’s arguable they committed too many men forward too early – they were completely out of the game with 20 minutes to go, whereas they might have been better playing patiently and increasing the pressure on Wolfsburg. The home side will have been delighted that the final 20 minutes was a non-contest, as they had probably tired. Guardiola will be concerned about how easily his team were exposed in the full-back positions, and how his midfielders were unable to get around Wolfsburg’s midfield pressure. But he tends to learn from his mistakes, and this might be a much-needed lesson ahead of the Champions League knockout stage, where other teams will look to counter-attack against Bayern. Just a heads up: You probably meant Lewandowski not Mandzukic in the paragraph about Boateng’s long balls. I have no doubt that Guardiola will get things right in the Champions league, but Shakhtar will have a full week to rest after meaningless friendlies as well. If they can press the Bavarians as well as Wolfsburg, I can see Douglas Costa making his name in this one. Was hoping you would cover this game as it was a big shocking result. Nice work on this. Great article as always, but I think you made a mistake? It should’ve been Lewandowski, shouldn’t it? Wonderful again. Hopefully you can do more analysis in the coming weeks. I’m interested in analysis of the upcoming Madrid Derby. Just a heads up, you meant Lewandowski or Muller not Mandzukic right? this has been kind of like a common feature in a guardiola team.. they are somehow very vulnerable to simple counter attacking play through the flank. One long ball to the sides of the centrebacks and then the whole defense is under pressure. Maybe he can change little to stop this from happening. I wish I could find a tactical assessment of the champions league favourites ahead of the knockout rounds.